Got me thinking. And then I read this article by Malcolm Gladwell in the New Yorker – an eloquent condemnation of the notion that it’s social media tools that have empowered people to make real change. He sure has a point. Martin Luther King didn’t need Twitter to mobilise a movement. 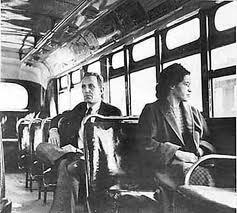 He didn’t say “I have a mission statement”, and Rosa Parks didn’t post on Facebook “Rode the bus today – some people got a bit angry when I wouldn’t give up my seat. Let’s start a revolution. Please ‘Like’ this”. In fact when you consider relatively recent historical events of say the last 200 years, it’s quite humbling to see what has been achieved, all without social networks. Think, William Cobbet’s pamphlets opposing the Corn Laws and support for Catholic Emancipation. Think, the Great Reform Acts, the Suffragettes, the Chartists, the Levellers, the overthrow of Ceaucescu and the Poll Tax riots. All examples of people power and mass mobilisation. The power of word of mouth and engagement. “Come down to Kennington Common – bring a friend” probably wasn’t exactly how the Chartists organised themselves, but you get the idea. And so are we any more different or more powerful than these people in history, now that we have Facebook and Twitter? Well, as I wrote about this week, a movement of people have persuaded Gap to change their logo inside a week of launching a new one, by mobilising quickly and effectively on social media and scaring the bejeezus out of a major brand. But now doesn’t that sound lame? The best we can do through these channels is to persuade a business to change its logo because we don’t like it. I’m not disparaging this event. In the history of business and commerce I think it’s a massive one. One that will be written about for years. But where are the flashmobs organised on Twitter and Facebook to protest against the travesty that is young carers having their childhoods taken from them as they have to perform the tasks that their handicapped parents are unable to carry out for example? Have we lost sight of what really matters and of what social tools could really do to help raise awareness and mobilise action? Has the nature of these tools themselves actually isolated and numbed people from what’s really happening in the world? What if people had clicked ‘Like’ on Rosa Parks’s Facebook status? Would they have left it at that and gone back to their lives? Previous PostFacebook Jumps Into Bed With MicrosoftNext PostIs Social Media a Coward’s Charter? Now I really LIKE this post!